There are 30 of us from different parts of the world. Many of them are architects and engineers. I am the only one from social sciences background and I wonder if I will be able to catch up what they are talking about. The first day was for introduction. The workshop is taking place in Gmunden, Austria and the instructors are Martin Rauch and Anna Heringer. There are two structures we have to make make. Both are by the side of the lake. One is a changing room for those who come there to swim in the lake (I wonder if they need it cos, they often swim naked . And the other is 2 pillars with a seat carved in it so that people can sit and enjoy the view of the lake. They brought tools and materials today. 1 lorry of sand+mud+stones. The mixture is brought from a brick factory. The mud felt a little clayey. Need to find out the actual composition. There was a bag of mud and another bag of sand. We were asked to play with mud and make any forms we wanted to make. As usual I sucked. I just played with it and kept making dough and of course kept my eyes and ears open. 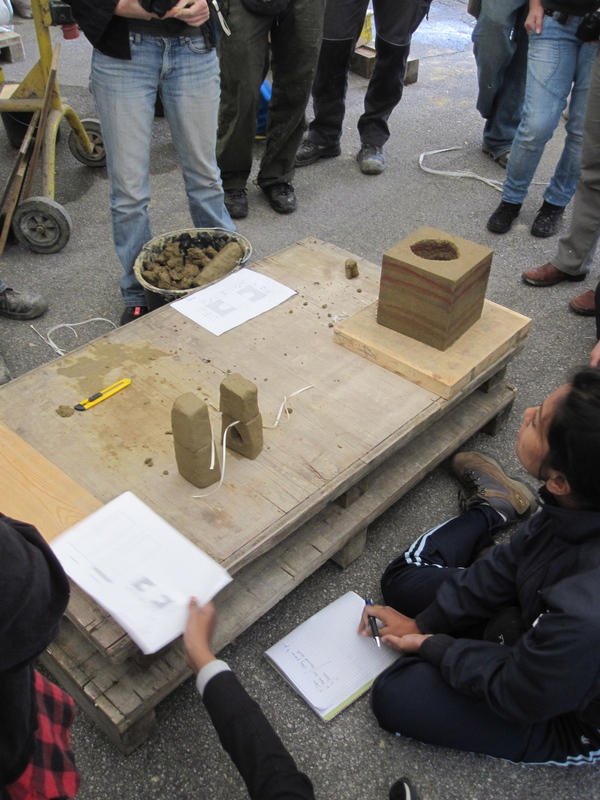 The other group made beautiful rammed earth. They also mixed color in it. They used toilet rolls in the middle to make hollow inside. They used mud and sand and rammed it with a hand rammer. Martin said, the moisture content in it was higher but he says it doesnt matter since its small and wouldn’t take much time to dry. In bigger structures, however the moisture content should be not more than 13 % and you can measure that by weighing and then baking it and weighing it again. Presentation by Susanne Gampfer on her work in South Africa. Introduction /Display of different material. They use a lot of horse hair and hemp for reinforcement, and Anna said in Bangladesh even human hair was mixed in mud. 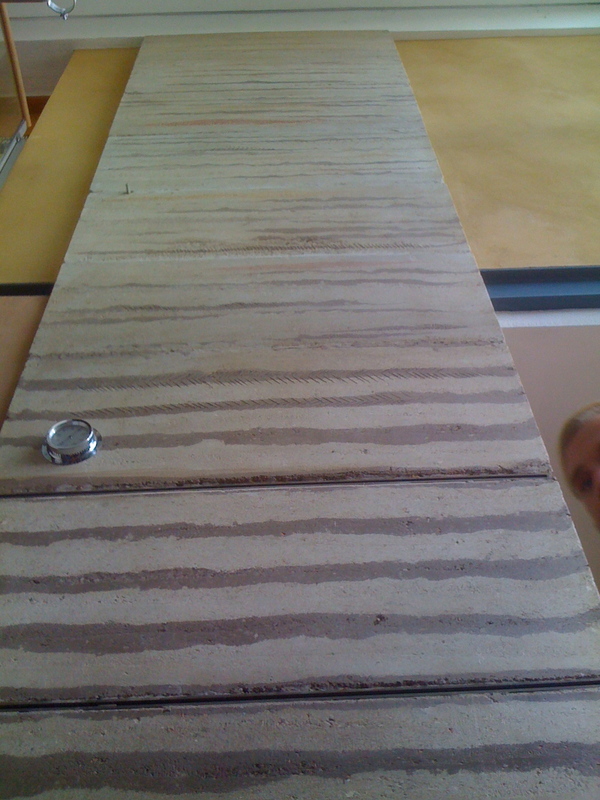 For rammed earth, big stones are better than small stones. Big stone prevent soil erosion, however proportion of the stone must not be too much. 6 buckets of factory soil (soil, gravels, sand,brick dust) + 1 bucket of sand + 2 buckets of big stones (sprinkel water on it) + 1 bucket of sedimented black soil. Mix well until the soil sticks to the stone. Leave it for 2 to 3 days after mixing them together. The forms have to be cleaned with oil every time you ram. 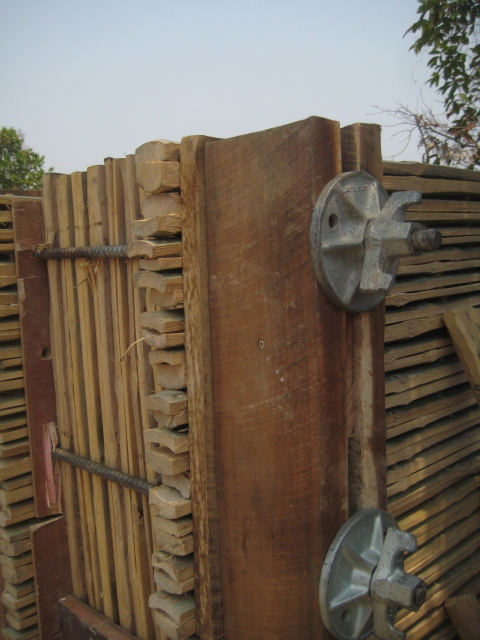 Prefabricated blocks dry in 3-4 weeks…also depends on the thickness of the wall. Not advised to prefabricate them and take them to some other area in trucks. Should be dried in room temperature rather than in direct sunlight. The best mixture so far with the soil here has been 6 part clay with stone , 1 part sand, 1 part stone that are 8-16 cm 2 parts of stone that are 16-32 cm and 2 part of black soil. This shuttering was designed by one of Martin's student. The thickness of the wall could be made by adjusting the holes. His workshop is 20 years old. Voraralberg gets heavy rain but he doesn’t have high pitch roof. 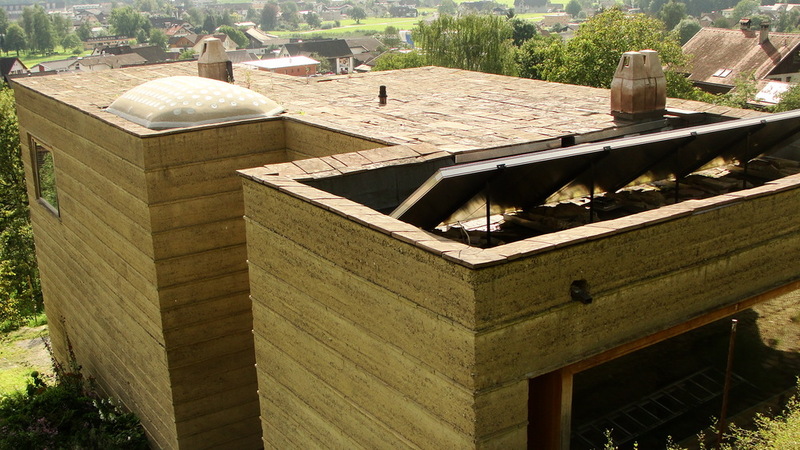 He has a flat roof with almost 15 cm overhang. The idea is to put slates that are stuck out of the surface in order to prevent erosion. He says water is good for earth unless there is a hole in a wall that stores water. As fast as the soil takes the water, it gives out fast too and while it gives out, the water carries minerals and salt of the soil and brings it out which makes the wall stronger. For a monolithic structure, it doesn’t matter much if few stones and soil is washed away. 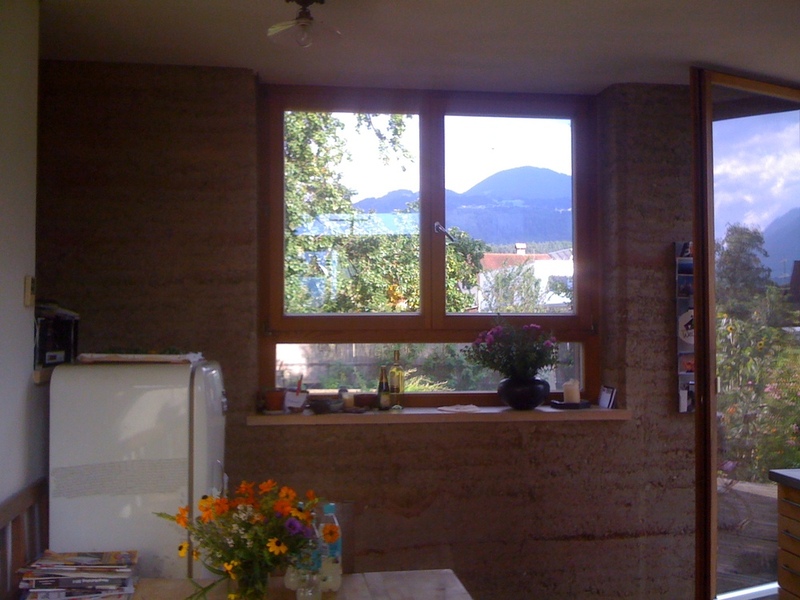 Some more pictures of rammed earth houses and structures made by Martin. 2 cm bricks ! Cute, aren’t they? 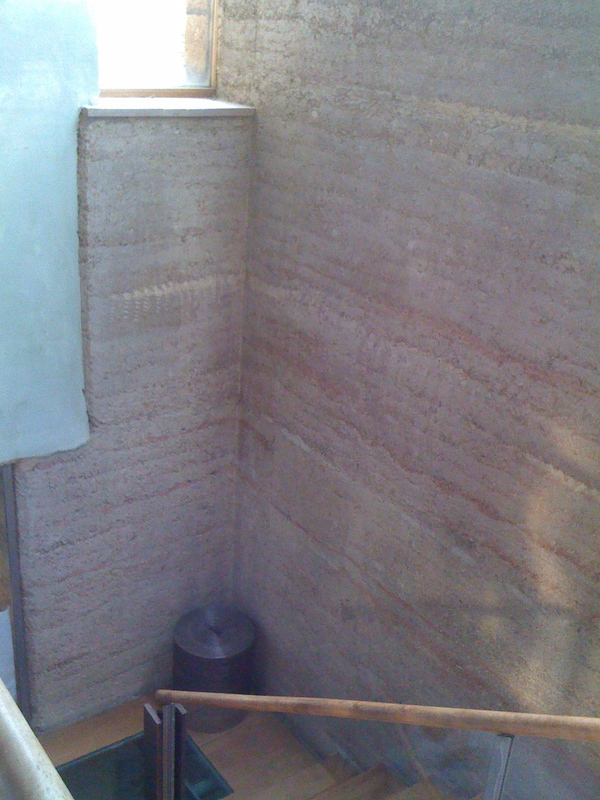 Right shuttering is one of the important factors of rammed earth technology. Shuttering has to be strong, fixed and of the proper shapes and angles. In developed countries ready-made shuttering made out of Iron and steel are often easily available (borrowing from concrete industry). However, in developing ones, they are made out of locally availiable materials like wood and bamboo. Showing the difference between mixing manually and mixing with the machine. In the shovel is the one mixed with the machine. As mentioned earlier, there is no fix proportion of what would make a best mixture, but one of the ways to know that the mixture has a right amount of water is to see if the clay sticks around the stones. Now that we had the forms, mixture and 30 people full of energy, it was time to hit the ground.